The combined choirs performed at a concert of the St. Matthew Passion in 2017. 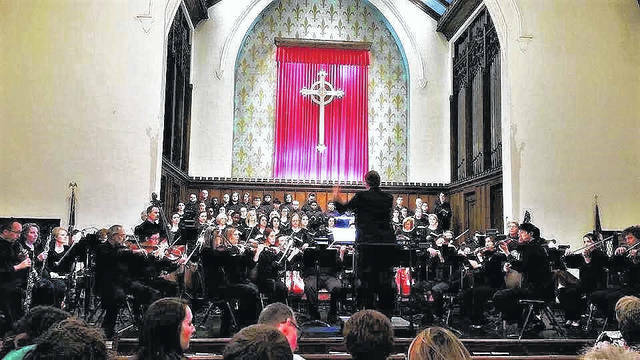 The Second Presbyterian Chancel Choir will combine with the Shawnee State University Choir and Chorale for a concert at 7 p.m. Sunday in the sanctuary of Second Presbyterian Church, Portsmouth. The concert will feature the music of English composer C.H.H. Parry, the Chichester Psalms of Leonard Bernstein, and the Requiem and Cantique de Jean Racine of French composer Gabriel Fauré. The choir of nearly 60 voices will be accompanied by a chamber orchestra, harp, percussion and organ, under the direction of Dr. Stanley Workman Jr., director of music/organist of Second Presbyterian Church and director of choirs at Shawnee State University. Serving as organist for the concert will be Portsmouth native Dr. Douglas Leightenheimer, organist-choirmaster at St. Michael and All Angels Episcopal Church in Tucson, Ariz.
Harpist Jane Zopff, formerly of Cincinnati, will return to southern Ohio for this performance. She is currently the harp teacher of the Westport & Orange Schools, and the Diller-Quaile Suzuki School of Music in Bronx, N.Y.
Second Presbyterian Church is located at 801 Waller Street. The concert is free and open to the public. https://www.portsmouth-dailytimes.com/wp-content/uploads/sites/28/2018/04/web1_Choir-1.jpgThe combined choirs performed at a concert of the St. Matthew Passion in 2017.